Do you want the best trailer training Hampshire offers? 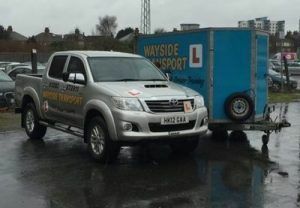 Look towards to Wayside Transport for a comprehensive training course that will equip you with the skills that you need. We have run training courses for the past 20 years and have helped many drivers from all backgrounds become better drivers. Call our team today on 01202 873 911 to find out more. 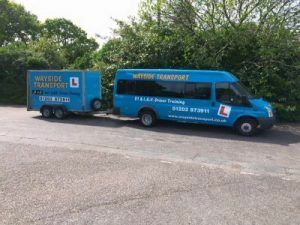 At Wayside Transport, we are the first choice provider for individuals that want to take a comprehensive trailer training Hampshire course. As part of the Full Bus D, Minibus Training D1, Minibus and Trailer D1+E course, you will be equipped to drive a wide range of trailers when they are attached to your vehicle and many more from the best training team in the county today. Whether you are an individual interested in our Hampshire trailer training course or a company wishing to equip the team with the skills they need, we tailor our course to suit your needs. Growing your skills is a great way to make sure that you stand out on the competitive job market. Equally keeping your staff well trained will enable your business to grow further and helps to retain key colleagues who feel the company is involved in their self development. For the past 20 years, we have been the first choice for companies wanting the finest trailer training in Hampshire. Driving a trailer requires a special set of skills, which need to be developed with the help of an instructor. We have a friendly and professional team that is on standby to help you throughout the course. If you need to remove a 101 restriction from your driving licence, please do get in touch. If you want to work as a professional driver then it is important to make sure that you are equipped to deal with every eventuality. With our dedicated training methods that enable you to put into practise what you have learnt, your learning will soon take on a fast and rapid approach. The forms will be supplied by our team who will organise all of the little details such as taking the test in the Southampton LGV and PCV centre. What is required before you start your Hampshire trailer training course? There are requirements before you sign up to our trailer training Hampshire, which we will outline as long as you keep reading. Want to find out more information about the course or the requirements? Call us today by clicking the number below and we will give you more information. Before embarking on a trailer training in Hampshire course, you will want to make sure that the person training you has the right skills. Every instructor at our school has a wealth of experience driving lorries, trailers and many more. They have all been trained to the industry’s highest standards and will help you develop your skills further while imparting their valuable knowledge. Due to the nature of our Hampshire trailer training courses, we do our best to mix both practical and theory sides of the course. Unlike other providers, you will be able to put into practise what you have learnt in the classroom at our dedicated facilities. The very nature of driving means practise really does make perfect. Here the team will be able to give you a full rundown on manoeuvres while offering positive feedback. Driving a trailer requires a special set of skills that you may not find in a textbook. We think that there is no better way to learn than from seasoned professionals. Operating and driving a trailer is something that has to be taught and demonstrated in person. The benefit of this approach for you are plentiful, the first of which is that you will have the skills which will be recognised by your employer. Secondly, you will feel more confident in your ability as you will have practise our manoeuvres many times over. Don’t miss out on your place at our trailer training Hampshire school, call us on 01202 873 911.